Exercise is important for healthy joints. Moving your joints daily helps to preserve or improve range of motion. Strengthening the surrounding muscles helps to support the joints. Also, joint movement transports nutrients and waste products to and from the cartilage, the material which protects and cushions the ends of the bones. There are different types of exercise and it is important to understand why each is necessary. Range-of-motion exercises are primarily gentle stretching movements which aim to move each joint through their normal maximum range of motion. These exercises need to be done daily to help keep joints fully mobile and to prevent stiffness and deformities. Range-of-motion exercises are important for people with arthritis who, because of intense or chronic pain, shy away from moving their joints through their full range. Some people believe that normal daily activities sufficiently take joints through their full range of motion, but this is not the case. Normal daily activities, such as housework, dressing, bathing, and cooking are not a substitute for range-of-motion exercises. Strengthening exercises help to increase muscle strength. Strong muscles help support the joints—making the joints more stable and helping you move more easily and with less pain. The two types of strengthening exercises are isometric and isotonic. Endurance exercises are physical activities that bring your heart rate up to your optimal target level for at least 20 to 30 minutes. Your target heart rate is computed based on age and physical condition. By raising the heart rate, endurance exercises improve cardiovascular fitness. Endurance exercises should be performed at least three times a week to build on their effectiveness. Not all arthritis patients are able to perform endurance exercises, however. For example, people with long-term rheumatoid arthritis who have severe joint damage and functional limitations may be unable to do this type of activity. Endurance exercises for arthritis patients need to be chosen carefully to avoid joint injury. Walking can be an excellent exercise choice. Walking helps build strength and maintain joint flexibility, aids in bone health, and reduces the risk of osteoporosis. Tai Chi is a gentle martial arts exercise with origins in ancient China. While performing fluid and flowing circular movements, you can relax, maintain mobility, and improve range of motion. Warm water exercise is an excellent way to build up strength, ease stiff joints, and relax sore muscles. The water helps support the body while the joints are moved through their full range of motion. Bicycling/cycling, both indoor and outdoor, may provide a good low impact exercise option. Cycling as an exercise can be either freestanding or stationary. Cycling equipment can be adjusted and adapted for many physical limitations. Running/jogging may still be a good exercise option if you run on softer surfaces. Walking or more gentle forms of exercise may be a better option, though, if you already have arthritis in your lower extremities. Contrary to popular belief, running does not cause osteoarthritis in people who have with normal, uninjured knees. Be consistent. Exercise should be performed daily. In order to see results and obtain full benefits from exercise, it cannot be done sporadically. But, consult your doctor to determine your ideal, individual program. Exercise when symptoms are least distressing. The best time to exercise is when pain and stiffness are at a minimum. Some people with arthritis prefer exercising after morning stiffness subsides. Others dislike afternoon exercise sessions because they grow more tired as the day progresses. It's a matter of personal preference. Do not overdo. Many strengthening and range-of-motion exercise programs suggest performing the exercises in sets of three to 10 repetitions, with each set repeated one to four times. There is no set number that works for everyone. The number of repetitions is dependent on how well you feel. Too much activity, especially during a flare, can aggravate or worsen symptoms. 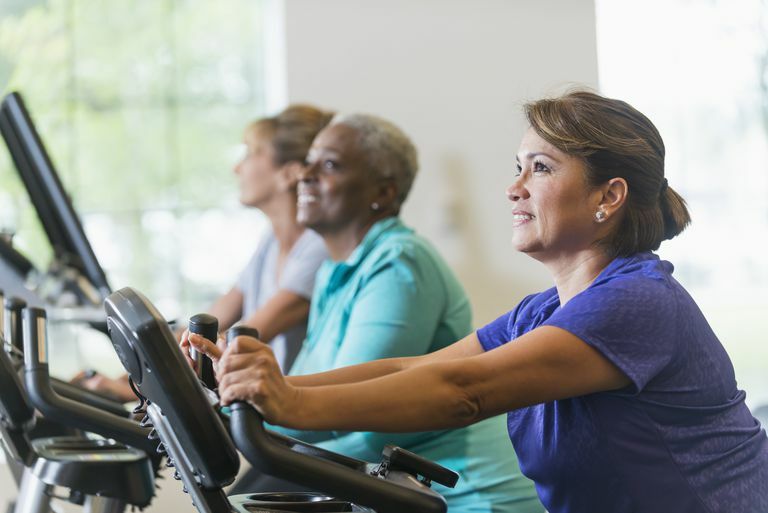 Therapeutic exercises are exercises that are recommended by a doctor, physical therapist, or occupational therapist with a specific goal in mind. Health professionals can help you design a fitness program which meets your individual needs. Marie Westby. Exercise and Arthritis. American College of Rheumatology. Reviewed April 2015. Gecht-Silver and Duncombe. Patient information: Arthritis and exercise (Beyond the Basics). UpToDate. Reviewed July 2016.